Impacts from the body’s response to keep the upper airway open with tiny adrenalin-like boosts to the airway musculature are set in motion with OSA. However, sympathetic nerve outflow (SNO) is also at work even when sleep is simply fragmented or truncated in an otherwise healthy respiratory system. The adverse mechanisms that OSA invokes to our cardiovascular system and metabolic processes are very well characterized. In addition to OSA however, central apneas that present due to opioid use are not widely discussed even though their impacts largely mirror those of OSA. In order to truly appreciate the impact of common sleep disorders and poor sleep quality, we need to glimpse the pathological means by which OSA can invoke cardiovascular disease and metabolic dysfunctions. As we consider these mechanisms, we need to also keep in mind that even poor sleep quality (independent of OSA) can invoke stress-like sympathetic outflow and transient hormone changes (including alterations from the normal timing and duration of cortisol and adrenalin) in otherwise young, healthy individuals, to present states similar to pre-diabetes and insulin resistance. Many of these mechanisms fall under a set of common “parent” mechanisms that appear over and over again in the association between sleep disorders and medical conditions such as obesity, diabetes, and heart disease. We will discover the diverse impacts that these simple mechanisms can invoke. Too often, however, sleep disorders and sleep degradation are still considered either downstream effects from other metabolic or medical conditions, or simply another item in a heavy basket that individuals with unhealthy habits are destined to carry by virtue of the clustering of conditions that poor lifestyle habits associate. As is the case for the term stress: unless we delve into actual causal mechanisms by which it acts and collectively impacts a wide array of other processes, we are unable to adequately appreciate its real action on the body. It turns out that many of the pathological mechanisms at play with poor sleep quality and common disorders such as obstructive sleep apnea and insomnia also involve stress-like mechanisms, only they are ramped up and concentrated within the context of other physiological processes. For OSA in particular, that key mechanism is specifically: an increase in sympathetic nerve outflow, or tiny adrenalin bursts during and after an apnea, which is a temporary cessation of breathing. This increased ‘sympathetic tone’ occurs at the expense of an increased ‘parasympathetic tone’ that should otherwise occur during sleep to shift the cardiovascular system toward decreased heart rate and pressure, and foster the depth and integrity of sleep architecture — important for an organized cocktail of hormone release, a portion of which protects us from metabolic stress. OSA and other sleep-disordered breathing (SDB) conditions are particularly harmful as we will discover through glimpsing the specific mechanisms below. After reviewing the Cardiovascular mechanisms that are discussed on this page, be sure to glimpse the Metabolic mechanisms that occur in tandem (accessed from link at bottom of page). 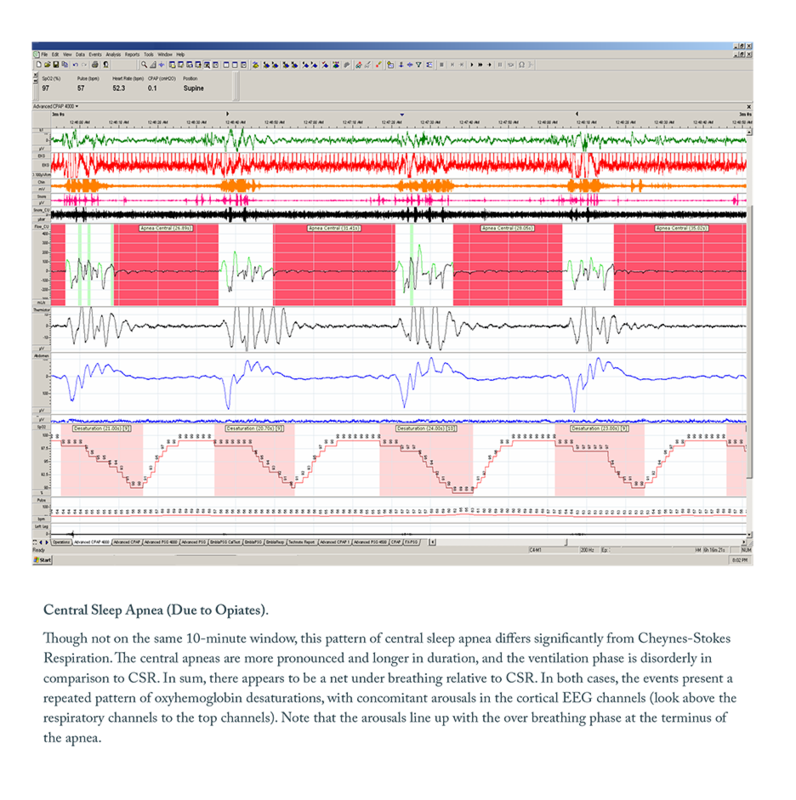 Finally, although OSA gains the lion's share of attention, central sleep apneas (CSA) due to opioids increasingly present as an emerging sleep-related breathing disorder condition that is on the rise relative to the traditional presentation of central apneas. It is not uncommon for the sequence described below to repeat hundreds of times per night in OSA patients, thereby fragmenting basic sleep architecture and setting in motion the diverse pathophysiological trajectories and disorders that are strongly associated with OSA. Obstructive sleep apnea (OSA) is an increasingly common condition characterized by repeated collapse of the upper-airway during sleep. 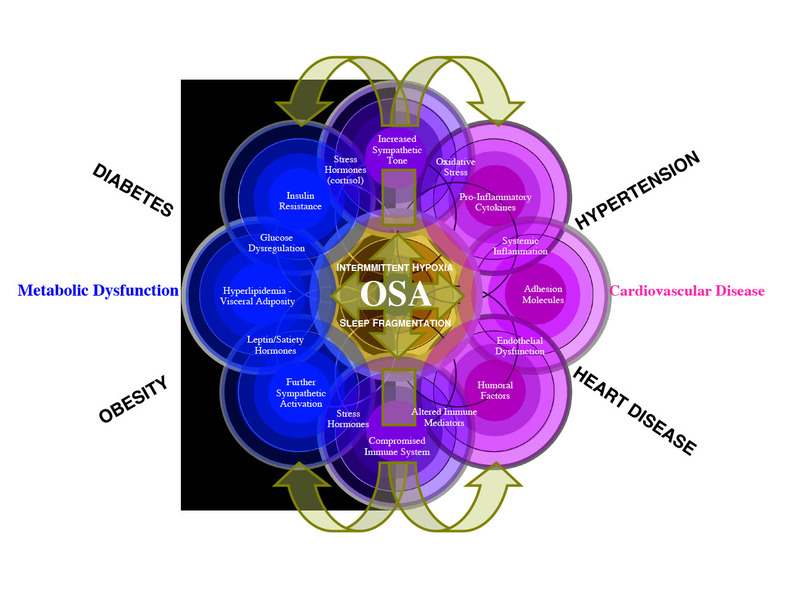 OSA, independent of the effect of obesity (i.e., not dependent upon the mechanisms of obesity), is associated with hypertension, hypercholesterolemia, arrhythmia, endothelial dysfunction, atherosclerosis, heart failure, cerebrovascular disease, insulin resistance, glucose intolerance, type II diabetes, dyslipidemia, and non-fatty liver disease. In OSA, repeated cycles of apnea and recovery cause hypoxemia (low oxygen) and reoxygenation with concomitant hypercapnia-and-hypocapnia alterations that drive sympathetic nerve surges to increase respiratory effort and overcome the collapsed airway resistance. Thus C02 retention and changes in blood pH from the collapsed airway drive a robust adrenalin-like response with an over-breathing phase that then overshoots the C02 balance to create respiratory instability, characterized by an aggressive cyclical ramping up and down of breath. During the apnea phase, oxyhemoglobin levels drop and carbon dioxide rises, setting up for a robust sympathetic-mediated (adrenalin) response to the appropriate upper-airway and respiratory musculature. Intra-thoracic pressure rises and transmural changes around the heart and lungs develop myocardial and pulmonary stress. At the end of an apnea, the heart is required to rapidly increase cardiac output precisely when oxygen delivery to its own tissue is at its lowest, thereby increasing the risk for myocardial infarction. 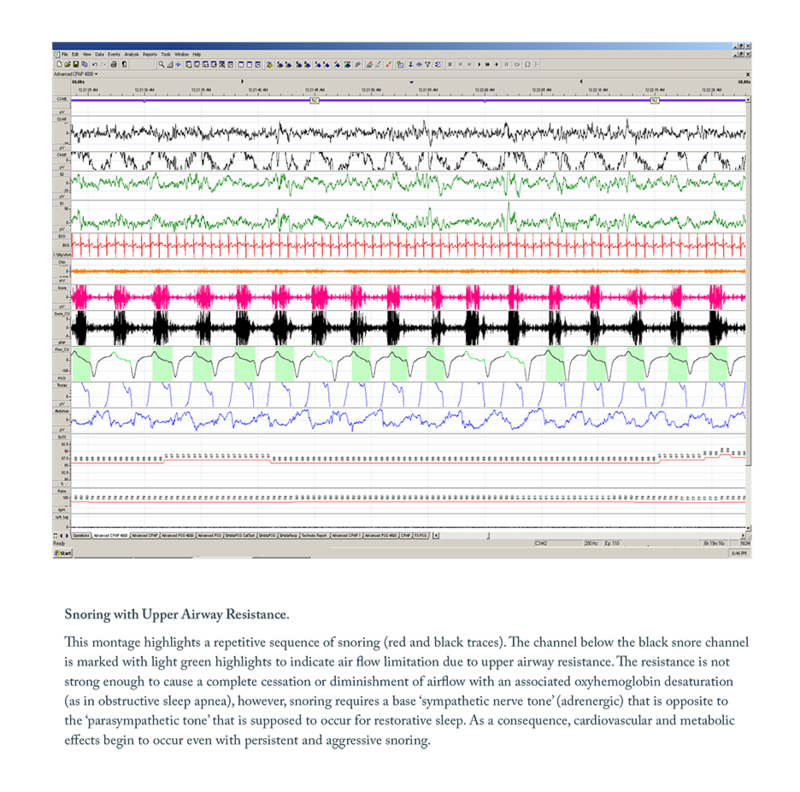 Recovery from the apnea includes an overbreathing phase with a rise in autonomic activity and blood pressure associated with a cortical EEG arousal that disrupts the continuity of sleep. Shallow sleep stages may predominate the entire sleep episode. 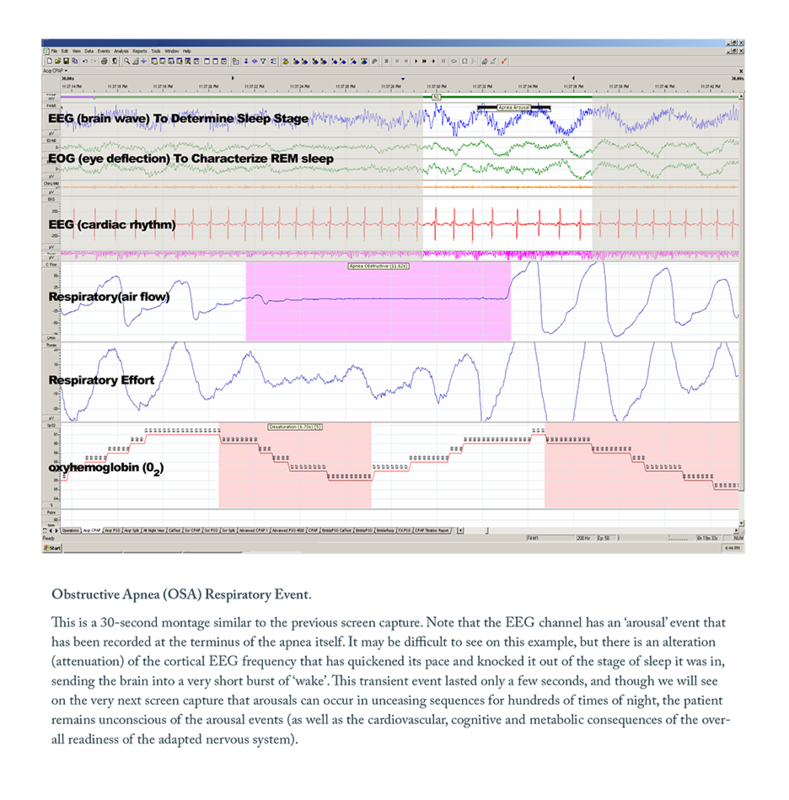 See the Sleep Architecture section to appreciate the basic functions associated with the compromise of necessary sleep stages and sleep-dependent process. 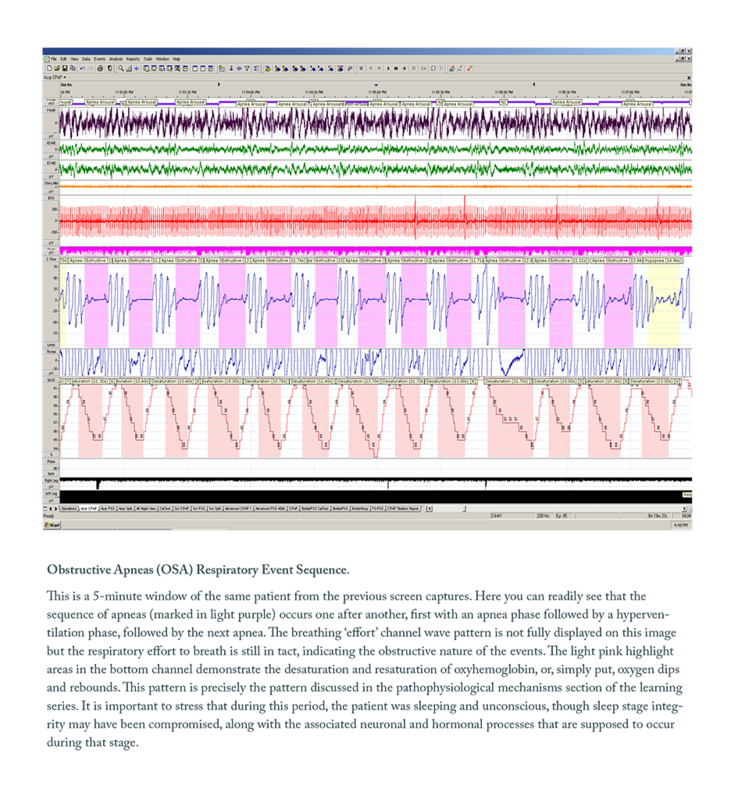 Note also: as you review the screenshots below that demonstrate sleep disordered breathing event examples, remember that normal sleep consists of a breathing pattern that is consistent and rhythmic, without the frequent and long pauses associated with disorders. In normal sleep, the balance of activity of the autonomic sympathetic and parasympathetic nervous system appropriately shifts in the parasympathetic direction. There is a progressive reduction in sympathetic nerve traffic. Heart-rate and blood pressure respond by dipping, particularly during the deepening stages of non-REM sleep. By contrast, the apneas and hypopneas present in OSA result in arousals that are associated with an increase in sympathetic activity and a decrease in parasympathetic activity— a reversal of the normal situation. The consequences of sympathetic activation include increased systemic vascular resistance, left ventricular afterload, vasoconstriction, and increased right ventricular preload with associated contractility changes, hypertrophy, tachycardia and arrhythmias. ‍Treatment of OSA and CSA decreases sympathetic activity. Primary snoring is not only an indicator of OSA, independent of OSA it can begin the process of increased sympathetic nerve outflow. As OSA advances, pathological mechanisms also advance on a number of fronts, including the presentation of hypertension and arrhythmias. Endothelial changes in the vessels and vasculature develop into atherosclerosis and heart disease from the same mechanisms. Advanced OSA sets up all of the pathology required for increased risk for heart attack, heart failure or a cerebrovascular stroke. Endothelial cells of coronary vessels and the peripheral vasculature play a critical role in vasoregulation, coagulation and inflammation. In the context of OSA and other forms of SDB, intermittent hypoxia may be more deleterious than sustained hypoxia. Reoxygenation during the overbreathing phase of the cycle delivers a rapid rise in oxygen molecules, providing a substrate for the production of oxygen radicals and oxidative stress. The cascade of hypoxemia-reoxygenation leads to vascular inflammation and endothelial changes, initiating a precursor stage in the athererosclerotic process. Endothelial dysfunction caused by SDB contributes to the onset or worsening of atherosclerosis and left ventricular dysfunction. Hypoxia also increases the expression of genes encoding for potent vasocontrictors such as endothelin-1 and endothelial growth factors (VEGF). Concomitantly, gene products that result in decreased vasodilation are reduced. Hypoxia also enhances expression of adhesion molecules. Large negative pressures are generated below the upper-airway obstruction during episodes of obstructive apnea. Negative pressure increases the pressure on the aorta, pulmonary vascular bed and the ventricles. During apnea, the increased hypoxemia and hyperapnea cycle progressively activates vasoconstriction. With resumption of an overbreathing phase, stroke volume increases because of an inspiratory increase in right ventricular filling. The increased stroke volume and heart rate result in cardiac output entering a vasoconstricted peripheral circulation, with consequent increases in blood pressure. Repeated exposure to nocturnal hypertension and hypoxemia contributes to left ventricular diastolic dysfunction. Pulmonary congestion and edema result from elevated left atrial and pulmonary capillary pressures. Hypoxemia, hypercapnia, adrenergic activation, increased afterload, and rapid changes in cardiac wall stress are conducive to the development of arrhythmias such as tachycardia-brachycardia oscillations, complete heart-block, atrial fibrillation and others. Undiagnosed OSA may be present in a large proportion of patients with atrial fibrillation. Abrupt and dramatic changes in intrathoracic negative pressures may especially affect the atria. In case you consider aggressive snoring to be only an indicating symptom of OSA, snoring alone can develop a stage that drives many of the same 'sympathetic' mechanisms that, in turn, drive hypertension and cardiovascular disease. In some cases, primary snoring (independent of OSA) can create acoustic vibrations that invoke endothelial changes ("hardening") of the carotid artery. You don't have to be a sleep technologist to see that the screenshot below does not look pretty. It demonstrates a string of long apneas in red that are produced "centrally", or by the brain's respiration center itself, as opposed to being a cessation of breathing from an airway obstruction while the brain continues the effort to breath normally, as is the case for OSA. The type of apnea below invokes many of the same mechanisms as OSA, with additional dangers. Note that it has a net "under-breathing" pattern, versus a mere cycling of over-breathing and under-breathing. Opioids reduce the respiratory drive in the brainstem, so the long red gaps in breathing shown below would increase with opioid dose such that there is a critical threshold whereby they would simply elongate enough to stop breathing altogether or invoke a severe cardiovascular or cerebrovascular event (a heart attack or stroke). 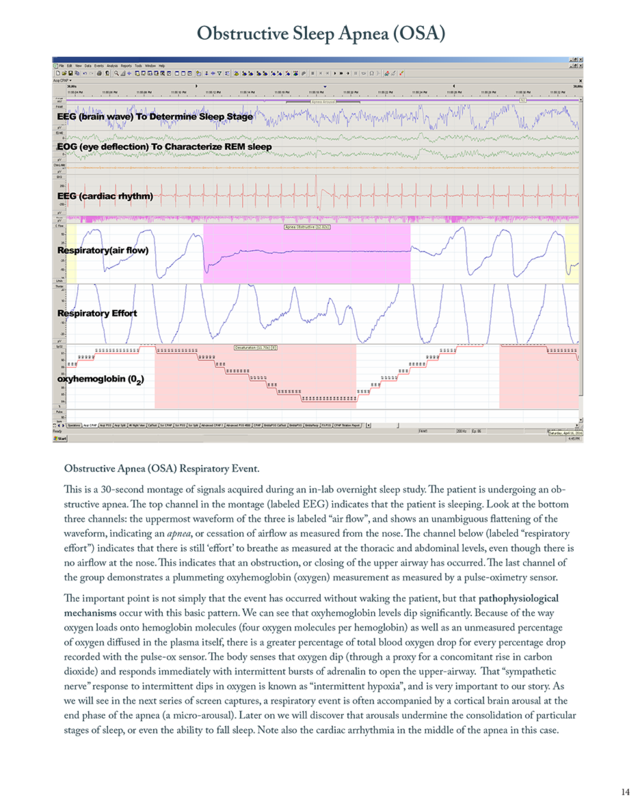 The description below the screenshot discusses Cheyne-Stokes Respiration (CSR), which is a different type of central sleep apnea (CSA) that is common to patients with congestive heart failure (CHF). We will not cover that topic in this section except to indicate that it manifests a characteristic net over-breathing cycle relative to the pattern exhibited with opioid use. CSR is driven by a slow perfusion rate of blood flow in CHF patients. In contrast, opioid-induced CSA is driven by a reduction in basic respiratory drive.